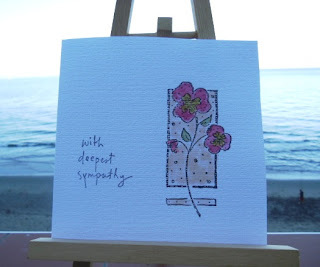 Beautiful card for a sad occasion, I like the stamp. Beautiful card and I love the view behind it! Love this entry, fabulous image and great colours. Lovely card Sylvie, such a beautiful stamp well placed! 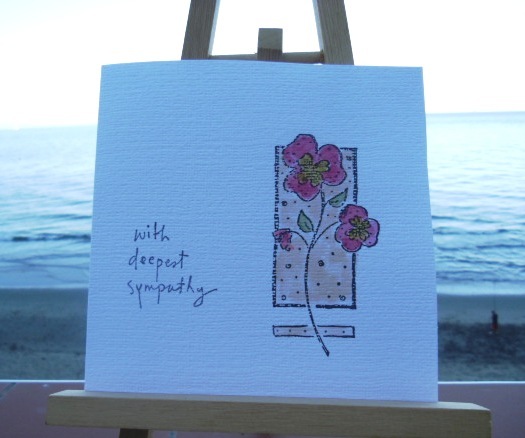 What a lovely sympathy card!! Love Penny Black stamps...have just started purchasing older ones on ebay...Your card is beautiful:)!! It's lovely and the image works so well with the sentiment. You may not be thrilled Sylvie,(I can't think why not) but it's a great card..pure and simple! Sylvie, the card is lovely! Don't be so hard on yourself. It's very difficult to come up with super unique cards week after week. I think this card is wonderful! beautiful card slyvie for such a sad time.